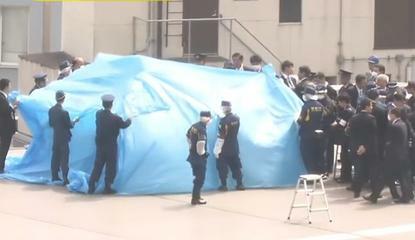 Police and security officials inspect a drone that landed on the Japanese prime minister's office in April. Security firm Alsok plans to launch a system to automatically detect unwelcome drones with high-powered microphones. Burglar alarms could soon incorporate drone-detection technology if a new service from a Japanese security company is anything to judge by. Tokyo-based Sohgo Security Services, also known as Alsok, plans to introduce a system that can detect incoming drones by listening for the signature hum of their rotors. The service could be aimed at government entities, corporations and key facilities such as nuclear power plants as a terrorism countermeasure. Other potential users are people or groups in the public eye who want to ward off the prying eyes of unmanned aerial vehicles. Alsok's move follows an incident last month when a quadcopter with trace amounts of radiation was found on the roof of the Japanese prime minister's office, apparently a protest of the government's nuclear energy policy. The system's high-powered microphones can pick up buzzing sounds from 150 meters away in any direction, and compare them against a database of drone sounds. The system is compatible with Alsok's Total Track security camera system, which can automatically detect and follow intruders in an area of coverage. Another possibility is for the drone detectors to work with what Alsok calls "Hyper Security Guards," which are staff equipped with wearable cameras and other mobile devices. They can be alerted to a drone's presence for investigation. Alsok has been developing security robots, including a bulky camera-equipped droid called Reborg-Q, since 1982. Last year, it launched a drone service to monitor large-scale solar power plants, and it also wants to use drones to check bridges and wind farm turbines, a spokesman said. Pricing and the timetable for the launch of the drone-detection system have not been decided yet, he added. Drones in Japan have been mainly used for research purposes such as monitoring the country's many volcanoes. Japanese manufacturers have yet to embrace the technology on a large scale, partly due to a lack of government regulations. The earthquake and tsunami that destroyed the Fukushima Dai-Ichi nuclear power plant four years ago, however, have spurred researchers to develop drones that can detect radiation and operate in environments with no GPS signals.